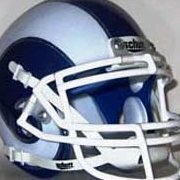 With this Offseason I believe the LA Rams will be in serious position dor an NFC Championship run. This year the Rams front office work on giving Wade Phillips the peices that he need in order to truly be given an chance at a Top 5 defense. The offense also will build off of last year with some much needed depth. So get ready to enjoy the ride to let the doubters know that we wasn't just a fluke or surprise last season. I'm a big fan of Frank Ragnow. I think he'd be a good get for us in the third. Would like to see a guard taken a bit earlier than the sixth, but overall I can't complain. I'd be pretty happy with this. It's a very good mock. Kudos! However, I'd be surprised if Kelly is available in the 6th, Tanner Lee is pretty terrible, and Lowell Lotulelei looked really bad in 2017. Thanks for the feedback man, I wouldn't of mind an gaurd earlier also. But our guards played very well last season, Jamon improved this season and Roger had a pro bowl type season. So that's why I decided to fill gapping holes in defense early, then make sure that we have some depth behind them, Blyth, Gossett and Carter at tackle. Thanks jrry, appreciate it, I do really like Kelly so I'm hoping he falls a round down. Now I haven't did alot of qb evaluation this year. I just seen Tanner at the senior bowl and said he might be worth a late round flyer to compete for a back up positon. Now I know Lowell had an down year in 2017. 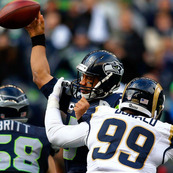 But to grab a big nose tackle in the 6th with some talent and potiontal I feel is worth a flyer on. Totally get it, plus it's hard to figure a guy drafted in the 6th round is starter material anyways. My only concern is Saffold and Brown have their contracts up after next season. Would be a bit worried heading into the off season needing two new guards, but sometimes that stuff happens. LOVE this offseason. Might be actually my best case scenario.